This is the cheapest starter of all and hence used very commonly for the induction motors. It uses tripple pole double throw (TPDT) switch. 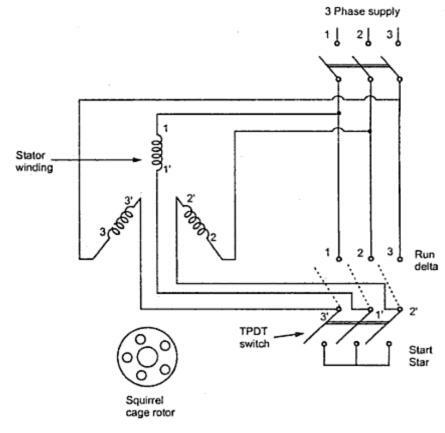 The switch connects the stator winding in star at start. Hence per phase voltage gets reduced by the factor 1/√3. Due to this reduced voltage, the starting current is limited. When the switch is thrown on other side, the winding gets connected in delta, across the supply. So it gets normal rated voltage. The windings are connected in delta when motor gathers sufficient speed. The arrangement of star-delta starter is shown in the Fig. 1. The operation of the switch can be automatic by using relays which ensures that motor will not start with the switch in Run position. The cheapest of all and maintenance free operation are the two important advantages of this starter. While its limitations are, it is suitable for normal delta connected motors and the factor by which voltage changes is 1/√3 which can not be changed. 1.1 Ratio of Tst to TF.L. Now the factor x in this type of starter is 1/√3. Example : A three phase induction motor has a ratio of maximum torque to full load torque as 2.5 : 1. Determine the ratio of starting torque to full load torque if star-delta starter is used. The rotor resistance and standstill reactance per phase are 0.4 and 4 respectively.